Climmbers retain access in Clear Creek (forest road 2060) because we have advocated for it. We have also contributed to maintainance efforts both on roads and trails and funded a minor road repair in 2015. The Squire Creek road (forest road 2040) ends where it is blocked by a massive slide that came down from Jumbo Mountain in 2003, about two miles short of the former Squire Creek Pass trailhead. Walking approaches for climbs presented on this website range from thirty minutes to two hours or more. The only crag served by a maintained trail is Three O'Clock Rock and even this one, although easily approached by local standards, is not a good candidate for sandals because the trail is pretty rough. Climbers have worked with Forest Service officials here for years. More recently, Snohomish County and Darrington officials, and a volunteer group called Friends for Public Use have been working with us as well. Please support those who support us, including the Washington Climbers Coalition and the Access Fund along with these local organizations who are promoting recreational access in Darrington and elsewhwere. In about 2000, the Forest Service actively proposed to gate the roads to Exfoliation Dome and to Green Giant Buttress, and the trail to Three O'Clock Rock had all but disappeared where it approached the crag. However, climbers wrote letters generally objecting to the road closures and voicing an active interest in working with the Darrington district headquarters to keep the area open. In 2005, the Clear Creek road was blocked by a major washout about four miles short of the closest climbing destination, Three O'Clock Rock. Initially, the Forest Service decided not to re-open the road, but a letter writing and telephone campaign spearheaded by the Washington Climbers Coalition and the Access Fund, two climbers' access advocacy groups, succeeded in getting this decision reversed. Thank you to all who helped with letters and telephone calls. In 2000 and 2001, the Access Fund, The North Face, and the Washington Trails Association (WTA) sponsored work parties on the Eightmile Creek trail. In 2003, a Forest Service trail crew or contractor performed further maintenance on up toward Squire Creek Pass. In 2006, the Everett Mountaineers sponsored a trail project targetting that portion of the trail leading to Three O'Clock Rock. In 2014, the Access Fund Conservation Team and the Washington Climbers Coalition worked on the trail. The Washington Climbers Coalition did some drainage work and brushing on the road in 2008 and 2011, and the Darrington Friends for Public Use has been helping with this in the past couple of years. In 2013 the Forest Service hired a contractor to cut brush along the roadside of FS 2060 and the first half mile of 2065 which leads to the Eightmile Creek trailhead. In 2014 the Forest Service contractor again cut brush on the 2060 road. In September 2015 volunteers sponsored by the Washington Climbers Coalition and Friends for Public Use completed some vital repair to a concrete ford on the Clear Creek road. The Forest Service has a very limited budget for road and trail maintenance but your support can make a difference. 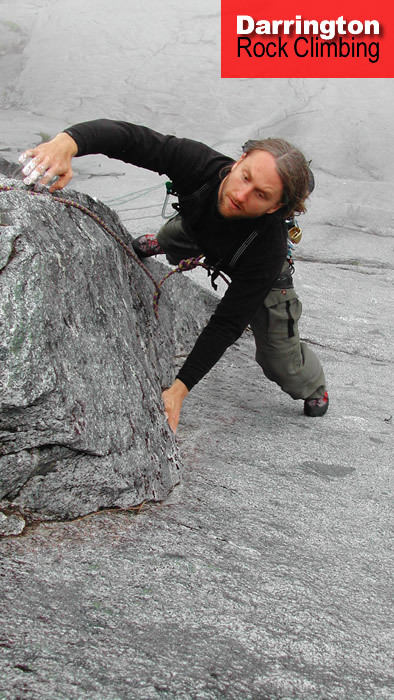 Please contact the WTA to sign up for trail project or contact the Access Fund and the Washington Climbers Coalition to offer support for, donate to, or get directly involved in efforts to promote and perserve access to Washington climbing areas. Volunteer with the Friends for Public Use to help keep roads open here and in the surrounding area. The recreational management staff in the Mount Baker Snoqualmie National Forest, and the local staff at the Darrington Ranger Station have been helful and responsive in dealing with related concerns. Letters of support for continued roadway and trail maintenance may be helpful there as well.